In troubled times, we all need help to remember that God is faithful and loving. These gentle instrumental recordings beautifully minister God's peace and encouragement to our hearts and minds. Tender piano and strings soothe the soul with arrangements of classic and popular worship songs. 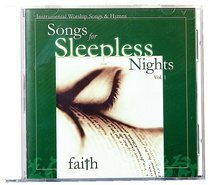 About "Faith (#01 in Songs For Sleepless Nights Series)"